“Greg is immensely talented as an entertainer AND communicator! He is also very proficient as a supervisor. Cooperative and Charming his talent is Endless! PS-Last I knew the card was still on the ceiling! Who is the Funbelievable Greg Phillips? Greg Phillips is the perfect entertainment for your next event. Greg captivates his audiences with amazing magic, hilarious juggling, animatronic puppets, and outrageous comedy. Since 1982, he has performed on National Television; including HBO, Showtime, and the A&E network. He has opened for such stars as Robin Williams, Jerry Seinfeld, Henny Youngman, Sid Caesar, Imogene Coca, Ray Charles, Maynard Ferguson, Tanya Tucker, Jimmy Walker and Gallagher. He has appeared in nearly a dozen countries on two continents. Greg has traveled extensively competing in local and national Magic Conventions receiving many awards and accolades. Greg continues to tour internationally, as a successful entertainer, and corporate speaker. He truly specializes in making your events amazingly successful, entertaining and Funbelievable! Greg tailors his presentations to your guests using fun magic, clean comedy, audience interaction making for a Funbelievable time! Your employees, guests and clients will enjoy the show and remember it for a LONG time because the presentation was created especially for them. All this makes you look like a hero. Your group will be entertained by a wide range of magic that is backed by a total satisfaction, money-back guarantee. Other magicians & entertainers don’t dare offer a guarantee on their services but in over 40 years of performing, not one person has ever asked for their money back from Greg. One of the important factors in creating a really special event is to make sure that your guests start having fun right away…minutes after they arrive. You’ll be delighted as you hear the gasps of amazement and laughter as your guests are entertained with their own 5 to 7-minute shows which include super fun magic that happens in their hands. This enchanting, fun, and intimate form of “walk around” entertainment is perfect for cocktail parties or as before dinner entertainment and at wedding receptions. It will leave the lasting impression you desire. STAND UP & STAGE COMEDY, MAGIC SHOW. Greg’s Funbelievable Programs Are Designed Specifically WIth You in Mind! 1. Comedy – You’ll be thrilled as you hear your audiences laugh and see all the smiles during my clean, but very funny programs! 2. Audience Participation – Keeping an audience’s attention can be a difficult task. Getting them involved is a sure fire way to ensure success. Greg’s rapport with the audience is a joy to watch. Everyone becomes a part! Everyone makes the “magic” happen! All are treated with respect, and have a great time participating in the program. 3. “Funbelievable” Illusions –Greg’s programs are filled with amazing illusions, creative object lessons, captivating stories, unique puppets, juggling and and his hilariously unique way of telling stories. It’s quality entertainment! 4. Personalized Shows – Every performance is individually tailored for your corporate message, theme, event or organization. I want to help you and the needs of your community. Whatever your need, I will plan a program just for your event! I become your spokesperson! 5. A Clear Concise Presentation Of Your Message or Theme – This is the area most “Performers” fall short. With 40 years of communication experience, Greg specifically designs each program to contain clear presentation of your message. Let Greg assist you in planning your programs, with great results. Is Greg able to entertain people who don't speak English? Thankfully, magic is very universally appealing to all walks of life! 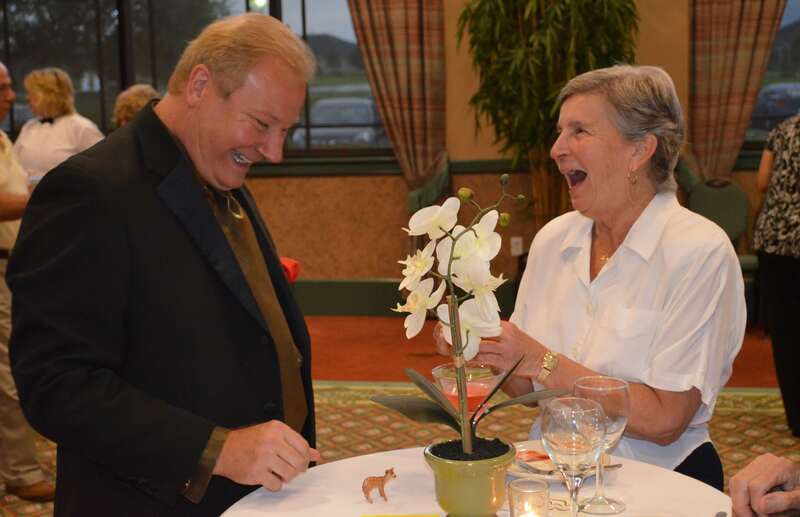 Although your non-english speaking guests may not totally understand every funny joke Greg makes, they will enjoy his physical comedy and still be thoroughly entertained and amazed by what they see! HOWEVER Greg presents several routines in Spanish when necessary. Greg is also experienced with working with a translator and had developed routines that make the best use of language interpreters. Yes, typically a 50% initial investment and signed agreement is required to reserve a date. The event is not fully booked with Greg until both of these items have been received. What do we need to provide on our end? What is needed varies based on the type of entertainment being provided. 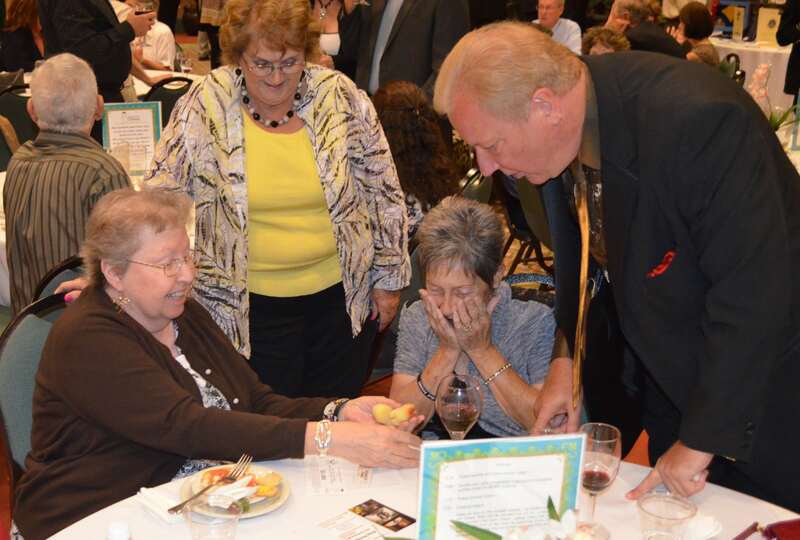 If you go with a strolling/close up magic package, where Greg is merely strolling through your event and entertaining the guests, there are virtually no additional requirements. Everything Greg needs he comes prepared with in his pockets ready to entertain when he arrives at the event. For the stage show packages, there are some important requirements that are needed in order for a successful performance. 1. If Greg is the only performer with equipment on the stage (besides a podium), then we recommend a stage at least 12′ x 8′ and at least 6 inches off the floor. Depending on how high the stage is, stairs might also be required as there is fun audience participation throughout the performance. In cases where Greg’s equipment would be sharing the stage with other performer(s), a larger stage me be necessary or other special considerations. 2. In most cases, Greg will provide his own sound system unless it’s a performance that requires air travel. In this case, we’ll also need a professional sound system setup and monitored throughout the performance. The best type of mic is a headset mic known as a “country man”. It is wireless and hands free. We also need an an input for an iPod for sound effects. Once again, most of the time Greg provides his own professional sound system. Please keep in mind that you still may have AV needs yourself and still may want to ask your venue to provide a microphone to show a presentation, announce winners, give speeches, etc. 3. In regards to lighting, we have no specific needs but do recommend not having your event too dark because it becomes more difficult for your guests to experience the amazing magic when they are struggling to see what’s happening. We accept checks, Visa, MasterCard, American Express, Discover and most ONLINE payment services. Arrangements should be made in advance for the correct method of payment. Is Greg able to entertain while people are eating? Technically yes but we really don’t recommend it. By the nature of the entertainment, your guests participate in the magic and are often asked to help out. This is sometimes difficult when people are eating. And also it’s hard to “watch closely” when you’re enjoying dinner. Will this embarrass or offend anyone? We’re proud to say that absolutely NO ONE is embarrassed in any way. We’ve heard many horror stories of how other entertainers have completely offended guests in the audience with off color jokes and remarks. Greg’s entertainment is completely G-Rated and never relies on entertaining people by making fun or laughing at people. What kind of room set up do you need for the stage show? Typically having the stage setup against a wall having all of your guests seated in front and as close as possible (this helps provide a more intimate feeling). Guests that are seated directly to either side of the stage or behind, have TERRIBLE seats and therefore it’s best to avoid that. A space that can comfortably seat all of your guests without having them on the sides or behind the stage is best. Also watch out for those huge annoying beams right in the middle of some rooms. Please take into consideration your guests so they don’t get stuck behind one of them and miss out on the fun. See the example room diagram below. Optionally, you can request “pipe and drape” for the stage which basically serves as the backdrop of the performance and gives it a nice feel. Greg also has a FUNBELIEVABLY THEMED Backdrop that he travels with that is 8 x 10. What size audiences can Greg entertain? Greg’s entertainment is best suited for all sized audiences. Greg entertains groups as intimate as 10 people all the way up to 500 guests in a ballroom. If you have a large group (200 or more), the use of projection screens makes the show even more enjoyable for your guests. Talk to your venue or contact a local audio/video company with questions to further explore that option. Greg gives you the tools to make your event a success! Greg shares his Funbelievable knowledge and experience after performing at over 5,000 + events and helps cut the learning curve to planning a successful special event. how to avoid costly mistakes and learn how to make your boss go WOW!